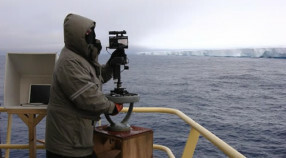 Returning to Antarctica eight months after a previous expedition, a research team led by Ken Smith continues to study biogeochemical cycles around icebergs using novel instruments. The summer-to-fall timing of this third expedition provides the opportunity to study the pelagic ecosystem near and far away from icebergs during prime growing conditions. 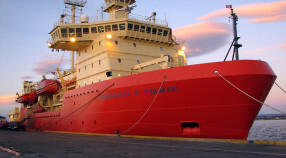 Working aboard the research vessel ice breaker Nathaniel B. Palmer, the scientists will target three to four tabular icebergs during their 40-day mission in the Northwestern Weddell Sea. Follow the team as daily updates are posted on this website with images and information about the research as it happens. 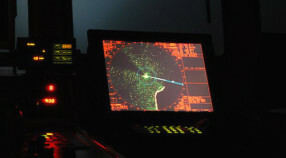 Track the ship’s voyage via the Google Earth link. And browse the other resources provided to learn more about the people, instruments, and science questions that are part of the expedition. Atmospheric warming has been associated with retreating glaciers, disintegrating ice shelves, and the increasing prevalence of icebergs in the Southern Ocean over the last decade. Our preliminary study of two icebergs in the NW Weddell Sea, an area of high iceberg concentration, showed significant delivery of terrestrial material accompanied by significant enhancement of phytoplankton and zooplankton/micronekton abundance, and primary production surrounding the icebergs. We hypothesize that nutrient enrichment by free-drifting icebergs will increase primary production and sedimentation of organic carbon, thus increasing the draw-down and sequestration of CO2 in the Southern Ocean and impacting the global carbon cycle. 1) What is the relationship between the physical dynamics of free-drifting icebergs and the Fe (Iron) and nutrient distributions of the surrounding water column? 2) What is the relationship between Fe (Iron) and nutrient distributions associated with free-drifting icebergs and the organic carbon dynamics of the ice-attached and surrounding pelagic communities (microbes, zooplankton, micronekton)? 3) What is the impact on the export flux of particulate organic carbon from the mixed layer? An interdisciplinary approach is proposed to examine iceberg structure and dynamics, biogeochemical processes, and carbon cycling that includes measurement of trace element, nutrient and radionuclide distributions; organic carbon dynamics mediated by microbial, ice-attached and zooplankton communities; and particulate organic carbon export fluxes. Results from this project will further our understanding of the relationship between climate change and carbon sequestration in the Southern Ocean. 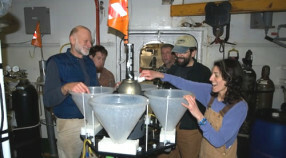 Please visit the PULSE 53: Pelagic-Benthic Coupling and the Carbon Cycle Cruise for more information on the history and background of this expedition.